Breathtaking views, charming picturesque corners and a heavenly beach are the attractions of a marvellous excursion that leads us to discover what is best in St. Martin with a tour of the most charming locations before an unforgettable break by the blue Caribbean sea: a dreamy setting to enjoy a perfect Creole lunch and relax barefoot in the sand. We leave the port on our air-conditioned coach and set off on a panoramic tour of the island crossing the border that separates the Dutch and French territories. We drive through the city of Philipsburg, the colourful Dutch capital of St. Martin with its streets flanked with palm trees and brightly-coloured houses, and pass by the Great Salt Pond north of Philipsburg surrounded by the city centre and suburbs. We thus reach the monument which denotes the border between the two dominions, modified 16 times between 1816 and 1948! We continue towards Grand Case, a characteristic fishing village which has become famous as the paradise of gourmands and reach the city of Marigot, French capital of the island. We go on a pleasant one-hour stroll in the city centre as we take in the typically European atmosphere with a charming Caribbean touch among lovely cafés and fashionable boutiques. The time has come to relax: we enjoy three hours of pleasant idleness on a marvellous beach which is one of the best in the island. 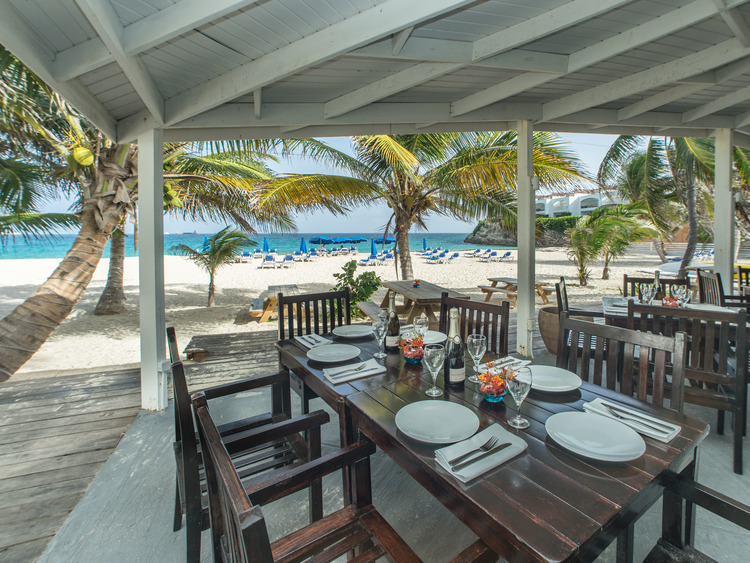 We also enjoy a delicious lunch featuring ribs, chicken and fish cooked on the barbecue according to the Creole tradition served with rice, beans and a fresh salad as well as with a rum or fruit punch. We stretch lazily on our lounger and have plenty of time to enjoy the beach as we please: we can take a dip in the blue sea, lounge lazily in the sun to top up our tans or go for a stroll on the shore to take in the enchanting Caribbean views. We have unlimited access to the rum and fruit punch to quench our thirst and toast to our time here! The time has come to go back to reality... but the fun is not over yet: on our way back, we can choose to stop in Philipsburg’s city centre and return to the ship on our own.